Teas are offered on or around select holidays in the early afternoon and are open to the public. Reservations are required. For reservations please call 703.248.5171. 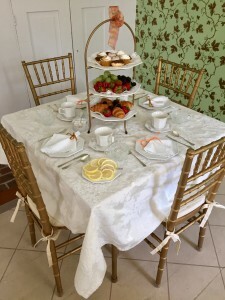 Our seasonal teas are hosted by a costumed docent who gives an entertaining talk in the formal parlor before ushering guests into the lovely dining room for a full tea. The tea includes sandwiches, assorted sweets, warm scones and a bottomless cup of tea. Some of our most popular seasonal teas are: Holiday Teas, Valentine’s Tea, and a Mother’s Day Tea. Special themed talk and teas are also offered. Check our events listings for upcoming teas. Private teas can be scheduled Tuesday through Saturday for groups of 12 or more people. The maximum number is 20 guests. The teas include a talk by the costumed docent, a full tea in the dining room and a tour of the farmhouse. Teas can be scheduled any time between 10 a.m. and 5 p.m. with evening availability on a case by case basis. For more information call 703.248.5171. Full Tea – includes sandwiches, sweets and tea or lemonade. $30.00 per person.